Philadelphia District Attorney Seth Williams discusses the benefits of The Choice Is Yours, during an open house at the program's new headquarters on Broad Street in October 2016. 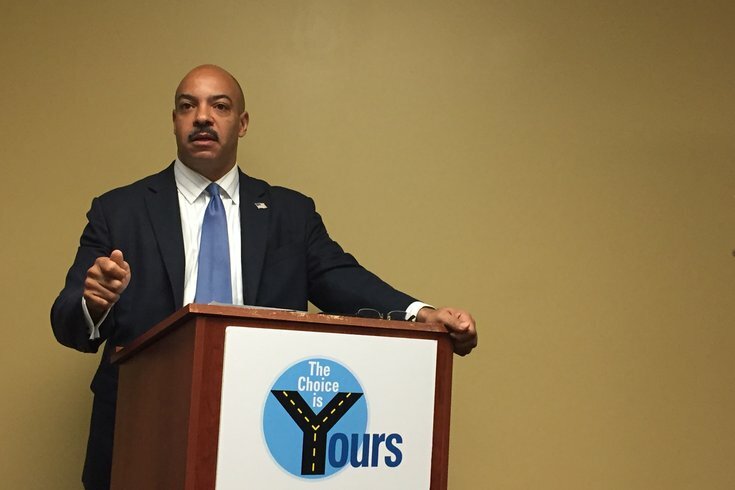 Last Wednesday, District Attorney Seth Williams told a crowd gathered at an open house for new offices of The Choice is Yours that the diversionary program is a ray of hope in a failing criminal justice system. "In my mind, our criminal justice system is failing us," said Williams, who helped create, in 2012, the program to help first-time, nonviolent, drug offenders get back on the straight and narrow. "All of the data shows that [it] works." Williams said The Choice is Yours has been a success because fewer than 20 percent of the program's clients are rearrested after completing the program. Recidivism rates for incarcerated offenders are about 63 percent, he said. But Philadelphia already had a successful program for ex-prisoners named The Choice is Yours. Five years before Williams' program launched, James Smallwood started a 13-week training program for ex-convicts, addicts and the homeless to teach them construction trades. In 2009, Smallwood won a $50,000 prize from Encore.org for his work. Smallwood filed for and obtained a federal trademark for the name "The Choice is Yours." But Smallwood's program, which served at least 600 individuals, is now shuttered – a victim of the name duplication, according to Smallwood's attorney, AJ Fluehr. In a lawsuit filed in U.S. District Court against Williams, the City of Philadelphia, former Mayor W. Wilson Goode and others, Smallwood had claimed the district attorney's program of the same name made it difficult for him to gain funding for his program. "We are alleging that he can barely get donations anymore," said Fluehr, of Francis Alexander LLC, the Media, Delaware County firm that took the band Led Zeppelin to court earlier this year for copyright infringement. While Smallwood would not comment directly on the lawsuit for this story, Fluehr said Williams "stole" the name in an effort to divert potential funding for Smallwood's program into his own program. "This was his baby," said Fluehr, of his client. "When the city took his name, they took the program." The real kicker, according to court papers, came when the Lenfest Foundation delivered $1 million in funding to Williams' program. In court documents, Smallwood claimed he was led by Goode to believe that his organization would receive the funding. Lenfest, however, committed the funds to the Williams program before it was even officially named The Choice is Yours, according to testimony by the defense. Instead, Smallwood alleged, that money was delivered to Williams' office and used to create the diversionary program in partnership with Philadelphia Municipal Court and the Defender Association of Philadelphia, and operated by Jewish Employment and Vocational Services. "Basically, they just took the name verbatim," Fluehr said. "And, we do think, in large part, the program itself ... Seth's program is just a watered-down version." 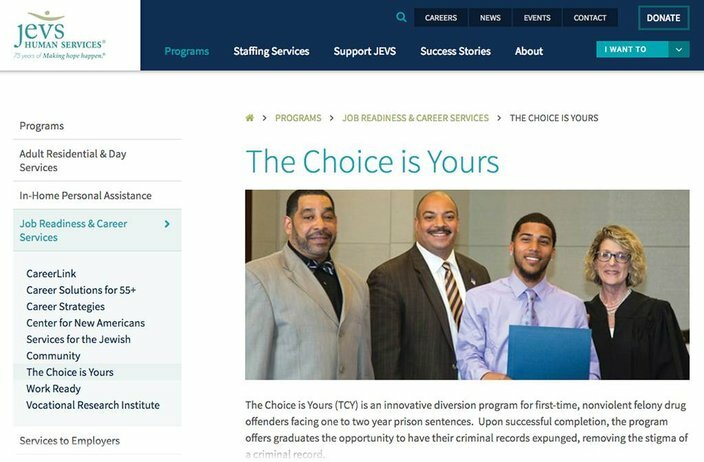 The home page for The Choice is Yours diversionary program, created by Philadelphia District Attorney Seth Williams and operated by Jewish Employment and Vocational Services. Smallwood developed the program after experiencing hardships in his own life, according to Fluehr. Formerly homeless, Smallwood told the Courier-Post in a 2009 article that he was "addicted to crack and cocaine" and overcame that addiction before starting his program. He hoped to help train ex-offenders and those struggling with addiction and homelessness to work in construction jobs. "He had a really hard life experience," said Fluehr. "He decided to start this [program] once he got over the hump." Subsequent to those meetings, Goode handed a folder of documents relating to Smallwood's program to Williams, the lawsuit alleges. The essence of Smallwood's claims is "that Goode took the booklet of confidential materials about his organization and gave them to District Attorney Williams, who then decided to name his new diversionary program after Smallwood’s organization and, with the help of [Public/Private Ventures], developed the program around it," court documents allege. Smallwood's original suit contended the program was a carbon copy of his own, but he has since pared down that claim, and others, in the current suit. In September, a judge removed Goode from the action and allowed the case to proceed on claims that Williams, Public/Private Ventures and the City of Philadelphia are liable for infringing and diluting the trademark of Smallwood's organization. "We voluntarily dismissed some of these defendants because we wanted to focus on who the players were," Fluehr said. The parties are expected to hold a conference on the lawsuit later this month, he added. After last week's open house for The Choice is Yours, Williams answered questions about the program in an impromptu interview with PhillyVoice. He said the four-word name was selected by an internal committee after a number of other names were considered. "The name we chose here [in the district attorney's office]. We had a committee of people look at a lot of different names and they chose The Choice is Yours," Williams said. The district attorney said he has never met Smallwood and didn't know anything about him, until he was served with the lawsuit on the street one day. "I never met this guy," Williams said. "I'm being sued and I readily admit, yes, I stole the kernel of the start of this program. But I did that from a different place, from the district attorney of San Francisco." Williams admitted he was inspired to create his program after seeing a similar one called "Back on Track" created by that city's then-District Attorney Kamala Harris. "I don't know this guy," Williams reiterated about Smallwood. The Philadelphia district attorney's program would appear to be different in a number of ways from Smallwood's. Williams' version provides job and educational training , and participants can get help to earn their high school diplomas. It spans a year and allows offenders an opportunity to get their charges dropped if they participate and meet regularly with a judge who monitors their progress. Clients of the program who serve as a mentor to other offenders for an additional year can have charges expunged from their records as well. In its first year, the program was offered to 100 individuals, with 75 opting into the program. Of the 25 who didn't enter the program, 19 were convicted of the charges against them, five are on the run after posting bail and one was found not guilty. Nigel Bowe, the program's director, said the district attorney's The Choice is Yours diversionary program has helped keep nearly 300 clients out of prison since its inception. Another difference is that more than half of the clients enrolled in Williams' program are already employed, according to Kristen Rantanen, vice president of communications for JEVS Human Services. Most of these individuals were likely working minimum wage jobs and turned to selling drugs in order to make ends meet. "They don't aspire to be drug kingpins. They are doing this for diapers or to pay the light bill," she said.